As a parent, you want your child to have a healthy, beautiful smile that lasts a lifetime. A part of achieving this is bringing your child in to see an orthodontist at an early age. Dr. Steven Mack and the entire team at Mack Orthodontics happily provide early orthodontic treatment as a means to ensure that your child’s smile and mouth develop correctly. Before you visit our Bettendorf, Maquoketa, or Eldridge office, you may have some questions about the process of early orthodontic treatment. As a part of our orthodontist’s commitment to making your treatment and experience as comfortable as possible, here is everything you need to know about early orthodontic treatment with Mack Orthodontics. An orthodontist can enhance your smile at any age. However, the optimal time to begin treatment is in early childhood. 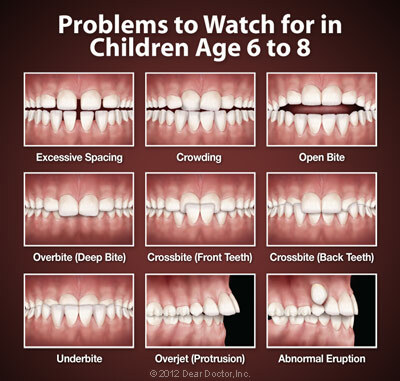 The American Association of Orthodontists recommends your child’s initial orthodontic evaluation take place at the first sign of an orthodontic problem, or by age seven. At this early age full orthodontic services like braces may not be necessary, but a vigilant examination allows your orthodontist to anticipate the most advantageous time to begin treatment. Additionally, commencing treatment at this time ensures the greatest long-term result and the least amount of time and expense. By the age of seven the first adult molars erupt, establishing the back bite. At this time your orthodontist can evaluate front-to-back and side-to-side tooth relationships. From that analysis she can predict how your bite will develop. For example, the presence of erupting incisors can indicate possible overbite, open bite, crowding, or gummy smiles. The earlier these evaluations are completed, the higher the chance for an incredible smile. Everyone has bad habits. 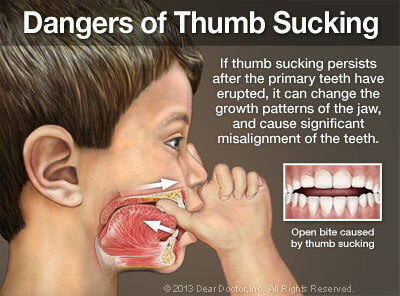 However, childhood oral bad habits such as thumb sucking, tongue thrusting, and mouth breathing can negatively influence the development and function of your child’s teeth, jaws, and mouth. Thumb sucking is a natural reflex in early childhood, which usually disappears between the ages of two and four. If it persists much later than that, the pressure of the digit on the front teeth and the upper jaw can cause the teeth to move apart and the jaws to change shape. This leads to the orthodontic problem known as “open bite,” and may impair speech. Tongue thrusting creates similar problems. Meanwhile, mouth breathing—an abnormal breathing pattern in which the mouth always remains open, passing air directly to the lungs—is related to alterations in the muscular function of the tongue and face. If left untreated, this condition can cause the upper and lower jaw to grow abnormally, which can lead to serious orthodontic problems. Various early orthodontic treatment options are available to help correct these detrimental dental and oral habits, and the sooner they're taken care of, the less damage they have the potential cause. That's one more reason to bring your child in for an early orthodontic visit with Dr. Mack. Is Your Child a Candidate for Early Treatment? Even if you like the way your smile looks, that doesn’t mean you should skip out on orthodontic treatment. Orthodontics does more than make a pretty smile—it creates a healthier, happier you. So get your child started on early orthodontic treatment. A visit to your trusted Bettendorf, Maquoketa, and Eldridge orthodontist today is a step toward a future of strong and beautiful teeth. Contact us directly, or book an appointment online.